Should I Buy Bitcoin in 2018? Subject: Should I Buy Bitcoin in 2018? With Bitcoin's erratic price movements plaguing crypto markets, many investors are asking: Should I buy Bitcoin in 2018? The truth is that even with Bitcoin trading 64% higher from this time last year, it's still a bargain price. You see, Bitcoin is still undervalued as a method of storing value and making payments. The underlying technology for Bitcoin, called blockchain, is considered revolutionary and is already being adopted by some of the biggest firms in the world. It will eventually disrupt everything from banking to the medical industry to music sales. 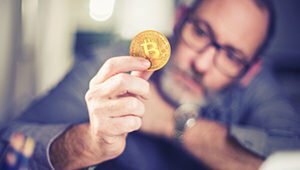 According to industry experts, Bitcoin has tremendous potential as a secure method of payment for a wide range of transactions. For example, using Bitcoin, a music artist could sell his or her latest hits directly to fans using Bitcoin's secure blockchain technology. This provides artists with more control over their work and gives fans more incentive to directly compensate a favorite artist for their work. That's a huge advantage over contemporary fiat currency, which largely requires self-interested third parties to manage electronic payments. Business Insider reports that Bitcoin's blockchain technology could also be used in the healthcare industry to securely store medical records. These types of electronic healthcare records will store details about patient care, which makes it easier for all specialists on a patient's healthcare team to access the data securely. Where Are Bitcoin Prices Heading?